Use the Visual State Manager to make changes to XAML elements based on visual states set from code. The Visual State Manager (VSM) is new in Xamarin.Forms 3.0. 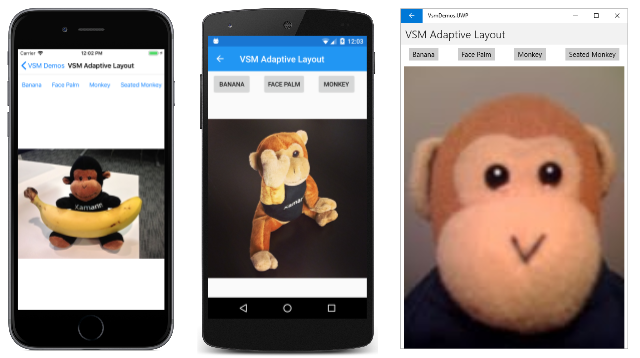 The VSM provides a structured way to make visual changes to the user interface from code. In most cases, the user interface of the application is defined in XAML, and this XAML includes markup describing how the Visual State Manager affects the visuals of the user interface. The VSM introduces the concept of visual states. A Xamarin.Forms view such as a Button can have several different visual appearances depending on its underlying state — whether it's disabled, or pressed, or has input focus. These are the button's states. Visual states are collected in visual state groups. All the visual states within a visual state group are mutually exclusive. Both visual states and visual state groups are identified by simple text strings. This visual state group is supported for all classes that derive from VisualElement, which is the base class for View and Page. You can also define your own visual state groups and visual states, as this article will demonstrate. 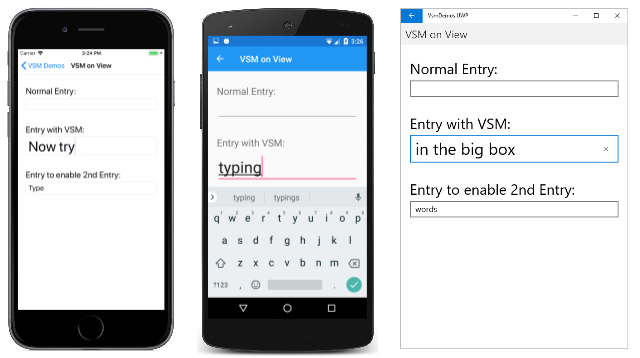 Xamarin.Forms developers familiar with triggers are aware that triggers can also make changes to visuals in the user interface based on changes in a view's properties or the firing of events. However, using triggers to deal with various combinations of these changes can become quite confusing. Historically, the Visual State Manager was introduced in Windows XAML-based environments to alleviate the confusion resulting from combinations of visual states. With the VSM, the visual states within a visual state group are always mutually exclusive. At any time, only one state in each group is the current state. The Visual State Manager allows you to include sections in your XAML file that can change the visual appearance of a view if the view is normal, or disabled, or has the input focus. These are known as the common states. The Entry should have a pink background when the Entry is disabled. The Entry should have a lime background normally. The Entry should expand to twice its normal height when it has input focus. You can attach the VSM markup to an individual view, or you can define it in a style if it applies to multiple views. The next two sections describe these approaches. It's given an explicit font size because one of the states will use the FontSize property to double the size of the text in the Entry. VisualStateGroups is an attached bindable property defined by the VisualStateManager class. (For more information on attached bindable properties, see the article Attached properties.) This is how the VisualStateGroups property is attached to the Entry object. You can use either x:Name or Name but not both in the same element. VisualState defines a property named Setters, which is a collection of Setter objects. These are the same Setter objects that you use in a Style object. Each Setter tag indicates the value of a particular property when that state is current. Any property referenced by a Setter object must be backed by a bindable property. The current visual state is "Disabled" so the background of the second Entry is pink on the iOS and Android screens. The UWP implementation of Entry does not allow setting the background color when the Entry is disabled. Notice that the Entry does not retain the lime background when it gets the input focus. As the Visual State Manager switches between the visual states, the properties set by the previous state are unset. Keep in mind that the visual states are mutually exclusive. The "Normal" state does not mean solely that the Entry is enabled. It means that the Entry is enabled and does not have input focus. It's often necessary to share the same Visual State Manager markup among two or more views. In this case, you'll want to put the markup in a Style definition. The remainder of the VSM markup is the same as before. This is the only Visual State Manager code that you'll find in the VisualElement class. Because GoToState is called for every object based on every class that derives from VisualElement, you can use the Visual State Manager with any VisualElement object to respond to these changes. Interestingly, the name of the visual state group "CommonStates" is not explicitly referenced in VisualElement. The group name is not part of the API for the Visual State Manager. Within one of the two sample program shown so far, you can change the name of the group from "CommonStates" to anything else, and the program will still work. The group name is merely a general description of the states in that group. It is implicitly understood that the visual states in any group are mutually exclusive: One state and only one state is current at any time. If you want to implement your own visual states, you'll need to call VisualStateManager.GoToState from code. Most often you'll make this call from the code-behind file of your page class. VSM markup is attached to the second Label (named helpLabel) and the Button (named submitButton). There are two mutually-exclusive states, named "Valid" and "Invalid". Notice that each of the two "ValidationState" groups contains VisualState tags for both "Valid" and "Invalid", although one of them is empty in each case. Notice also that the GoToState method is called from the constructor to initialize the state. There should always be a current state. But nowhere in the code is there any reference to the name of the visual state group, although it's referenced in the XAML as "ValidationStates" for purposes of clarity. Notice that the code-behind file must take account of every object on the page that is affected by these visual states, and to call VisualStateManager.GoToState for each of these objects. In this example, it's only two objects (the Label and the Button), but it could be several more. You might wonder: If the code-behind file must reference every object on the page that is affected by these visual states, why can't the code-behind file simply access the objects directly? It surely could. 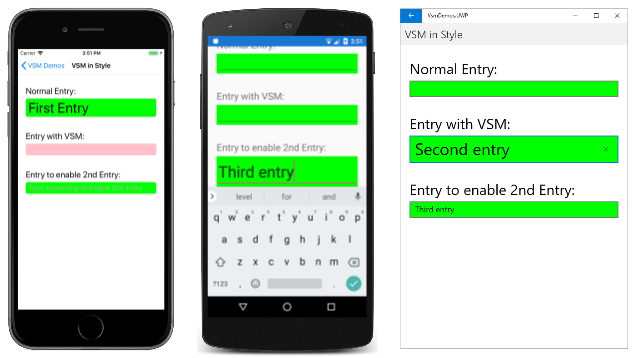 However, the advantage of using the VSM is that you can control how visual elements react to different state entirely in XAML, which keeps all of the UI design in one location. This avoids setting visual appearance by accessing visual elements directly from the code-behind. It might be tempting to consider deriving a class from Entry and perhaps defining a property that you can set to an external validation function. The class that derives from Entry can then call the VisualStateManager.GoToState method. This scheme would work fine, but only if the Entry were the only object affected by the different visual states. In this example, a Label and a Button are also be affected. There is no way for VSM markup attached to an Entry to control other objects on the page, and no way for VSM markup attached to these other objects to reference a change in visual state from another object. 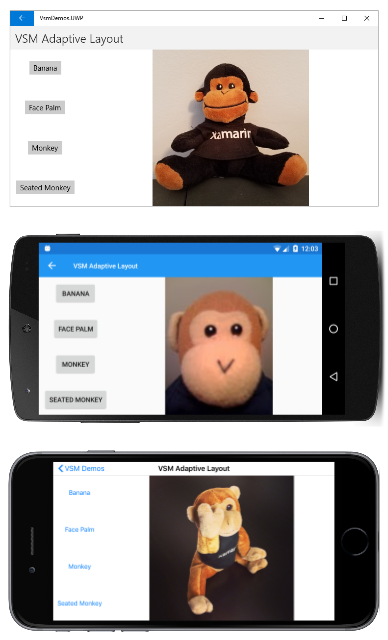 A Xamarin.Forms application running on a phone can usually be viewed in a portrait or landscape aspect ratio, and a Xamarin.Forms program running on the desktop can be resized to assume many different sizes and aspect ratios. A well-designed application might display its content differently for these various page or window form factors. This technique is sometimes known as adaptive layout. Because adaptive layout solely involves a program's visuals, it is an ideal application of the Visual State Manager. From top to bottom, the program is running on the Universal Windows Platform, Android, and iOS. The inner ScrollView named menuScroll and the StackLayout named menuStack implement the menu of buttons. The orientation of these layouts is opposite of mainStack. The menu should be horizontal in portrait mode and vertical in landscape mode. The fourth section of VSM markup is in an implicit style for the buttons themselves. This markup sets VerticalOptions, HorizontalOptions, and Margin properties specific to the portait and landscape orientations. The SizeChanged handler calls VisualStateManager.GoToState for the two StackLayout and ScrollView elements, and then loops through the children of menuStack to call VisualStateManager.GoToState for the Button elements. It may seem as if the code-behind file can handle orientation changes more directly by setting properties of elements in the XAML file, but the Visual State Manager is definitely a more structured approach. All the visuals are kept in the XAML file, where they become easier to examine, maintain, and modify.